3A Composites USA’s all new PRO Series – the next generation of graphic display boards featuring enhanced printing surfaces – will be introduced at the ISA International Sign Expo 2017 to be held April 20-22 in Las Vegas. Show-goers are invited to stop by 3A Composites’ Booth No. 1339 at the Mandalay Bay Convention Center to learn more about the PRO Series and view samples of Gatorfoam® PRO, Sintra® EDGE and Foam-X® PRO – the first graphic display boards introduced in the PRO Series line. 3A Composites USA is launching the PRO Series with three of its lines of high-performance rigid substrates – Gatorfoam PRO, Sintra EDGE and Foam-X PRO – and will be expanding the PRO Series in 2017. Gatorfoam PRO offers all of the characteristics of one-of-a-kind Gatorfoam, the original heavy-duty graphic display board that is uniquely constructed with polystyrene foam bonded between two layers of wood-fiber veneer laminate to make it rigid yet lightweight and warp-resistant. With enhanced PRO facers designed to offer superior ink adhesion and printability resulting in vibrant images, Gatorfoam PRO is a totally unique high-performance graphic display board that offers outstanding dimensional stability. Gatorfoam PRO’s enhanced facers also offer increased dent and scratch resistance during fabrication and display of graphic designs. Gatorfoam PRO is perfect for creating point-of-purchase displays, exhibits and kiosks as well as interior and exterior signage and can be used in framing applications. 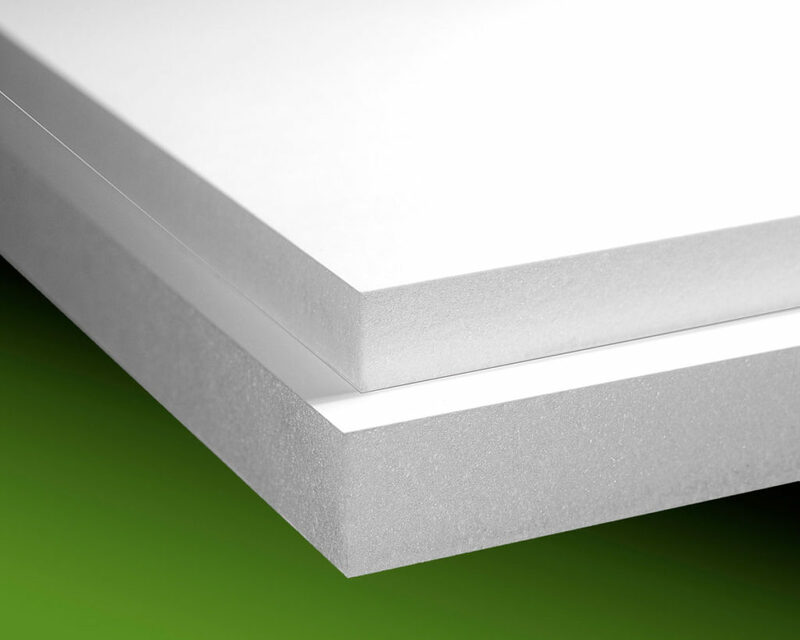 Gatorfoam PRO is available in 3/16-inch and ½-inch thicknesses in 48-inch by 96-inch sheets in color combinations including bright white facers/white foam and black facers/black foam. Sintra EDGE offers fabricators the latest advancement and ease in printing vivid images on a black PVC board while retaining the dramatic dark look of black edges all around. Sintra EDGE is comprised of moderately expanded polyvinyl chloride (PVC) in a homogenous sheet with a low-gloss matte finish. Sintra EDGE features a PRO surface coating in white on one side that readily accepts ink in direct printing applications. 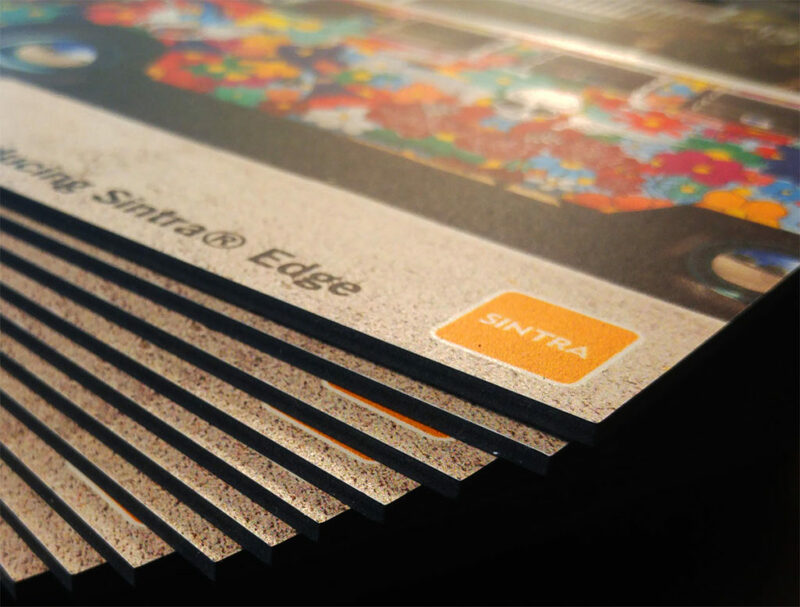 Sintra EDGE saves fabricators both time and money by eliminating the need for either print pre-coating or laminating processes. The Sintra EDGE PRO surface coating is thoroughly applied in a thin layer maintaining the dramatic look of this graphic display board’s dark edges. Just like Sintra graphic display board, durable-yet-lightweight Sintra EDGE is easy to fabricate with wood or foam board techniques. It cuts cleanly, creating smooth edges. Sintra EDGE fabricates easily without special tools and can be formed into limitless shapes. Sintra EDGE is heat formable and chemical resistant and offers superior dent and scratch resistance. Sintra EDGE is perfect for creating point-of-purchasing displays, exhibits and kiosks, and interior and exterior signage and can be used in mounting and framing applications. Sintra EDGE is available in the 3mm, 6mm and 12.7mm thicknesses in 48-inch by 96-inch sheets in the one black facer/one white facer/black core color combination. Foam-X PRO offers all of the memory retaining benefits of original Foam-X graphic display board plus enhanced printability. Foam-X PRO is comprised of rigid, non-pillowing extruded polystyrene foam bonded between two clay-coated paper liners that have been enhanced to produce vividly printed images. Foam-X PRO offers increased rigidity and stability with a memory core that is resistant to denting. Foam-X PRO can be die cut without creating pillowed edges. Rigid Foam-X PRO graphic display board is perfect for creating cost-effective point-of-purchase displays, interior signage, and exhibits and kiosks and can be used in framing applications. 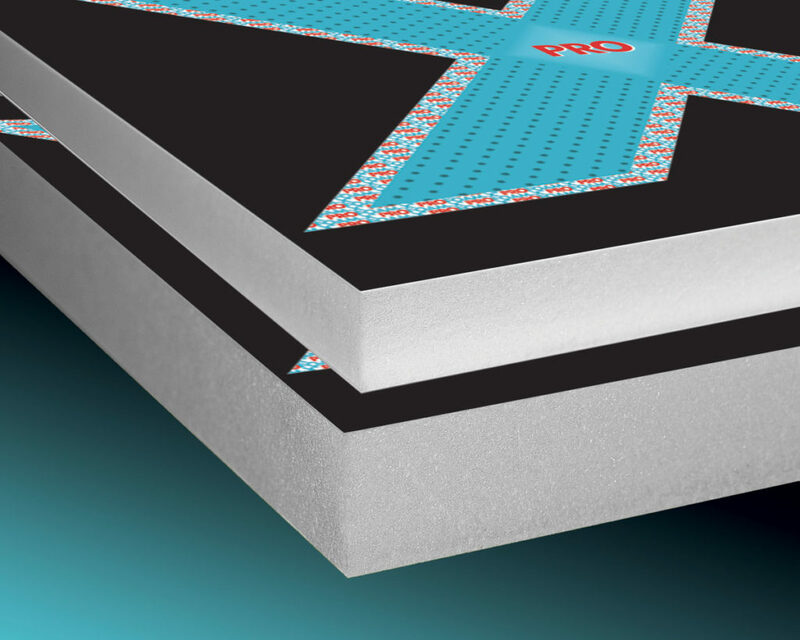 Foam-X PRO is available in the 3/16-inch thickness in 48-inch by 96-inch sheets with bright white liners and white foam.